Tower defense games have seen a resurgence in popularity thanks to games like PixelJunk Monsters on the PSN, and Savage Moon seeks to capitalize upon this trend. However, whereas PixelJunk Monsters proved that tower defense games can be highly engaging and strategically deep, Savage Moon suffers from some turret issues, erratic AI and a significant exploit that reduces the game to a tech race. The story behind Savage Moon is simple enough: in the distant future, humans have long depleted the resources found on Earth, and have spread across the stars to harvest resources from wherever they can. They soon discover planets called Imoons that are resource rich and contains the three minerals essential for galactic survival (Coltan, Zirconolite, and Hematite). Of course, there is a huge catch to extracting these minerals. Imoons are actually living asteroids that contain an auto-immune system that protects itself like a living body would. This auto-immune system manifests itself in the form of Insectocytes - swarms of savage bug-like creatures - that defend their Imoon with relentless attack. To protect your mining operations, you have at your disposal a selection of 12 towers, some for attack and some for support. 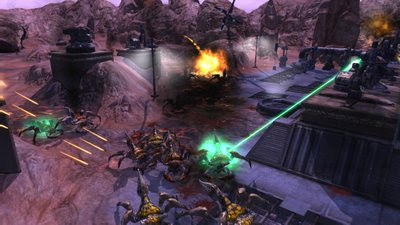 You begin the game with Machine Gun Towers, a basic turret with rapid-fire and low damage. Through researching technologies, you can deploy advanced towers, each with their own unique properties. For example, Mortar Towers provide high explosive indirect fire, Laser Towers fire concentrated laser bursts and Mine Towers launch land mine in between enemy waves. In addition, all towers can be upgraded five times for additional firepower. The strategy doesn't stop there though, as there is a catch. Towers can only be built on level ground or on Blocking Towers and cannot be placed on uneven or volcanically active rock. While this is conceptually easy to grasp, it's sometimes hard in practice to tell exactly where you can and cannot place turrets. Often times it boils down to an unnecessary exercise of moving your cursor around the map to find acceptable turret landing locations. To add some more depth to the strategy, early on the game introduces Command Skills that allows you to alter you attack, defense and economic capabilities. If you want to add some attack power to your turrets, turn on the Weapon Bonus. For added protection, turn on the Armour Bonus. Finally, for additional dollars per kill, flick on the Credit Bonus. There is one snag however, by turning on a bonus you automatically drop your rating in the remaining two categories. Turning on two of the three bonuses with give you a small boost to each, while decreasing the remaining stat. While Command Skills add a little strategy, the basic concept seems to revolve around maxing out your Credit Bonus during the initial, weaker enemy rounds, and and eventually moving your bonuses to Weapon/Armour as the enemies get more advanced. 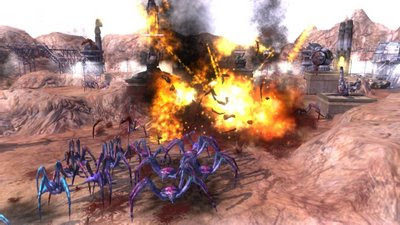 The games also gives the player the power to manually advance the next enemy wave before the natural clock time. As a reward, the player is awarded with extra credits to be used towards deploying towers, researching technologies or upgrading your towers. The Insectocytes in Savage Moon are varied and plentiful. You'll initially encounter basic ground units such as the crab-like Swarmers and Soldiers, as well as air units such as Flyers and Stings. As you progress, the Insectocytes evolve into larger and more deadly creatures. For example, on the second Imoon you discover, large spider-like Tanks will attack you with relentless vigor. Insectocytes are habitual creatures that march toward your mining operation using the path of least resistance, which can cause a lot of frustration. If you place a tower in the direct path of the insects, they occasionally exhibit sentience and will take another, less dangerous route to your base. Often times, this redirection will result in Insectocytes taking paths your turrets cannot reach - and leading to the destruction of your mining operation. You'll need to do a little trail-and-error experimenting to see how various tower emplacements affect your enemy movements. Compounding this frustration is the often unpredictable and erratic behaviour of your towers. For some bizarre reason your Machine Gun Towers go into a dazed surveillance mode when not attacking, often taking them many seconds to refocus their turrets when enemy forces approach. Your attack towers also seem to switch focus at random, allowing partially damaged Insectocytes to pass by your offensive without notice. Further aggravating the situation is the seemingly uselessness of certain towers. Laser Towers, while powerful, take so long to recharge that you'll wonder why you ever built one in the first place. Also, Mine Towers frequently lob grenades completely outside the path of the bugs and even on high ground they can't walk on. However, all that pales in comparison to the strategy crushing exploit that plagues this game. Once you reach the second Imoon you'll unlock Amp Towers that boost all the stats of surrounding towers. Even one Amp Tower can boost the range, damage and area effects of your towers to obscenely high levels. Even still, you can drop multiple Amp Towers, thereby exponentially increasing all your tower stats. With only a handful of Amp Towers, you attack towers range can increase to literally 1/2 of the map, and your traditionally weak Machine Gun Towers can wind up being more powerful than your highly explosive Mortar Towers. When you add a Repair Tower to the mix, your Amp boost is so effective you literally have an indestructible wall of defense. To keep the game fair, there should have been a cap on the amount of boost Amp Towers can provide. The audio and visual aspects of the game are mixed bag. Sounds mainly consists of bug squeals, cries, shrieks and wails. The music is very atmospheric and industrial, giving you all the clanks and bangs you'd expect from a mining operation. The graphics of the maps are okay, if not a little bland. Thankfully, the Insectocytes are nicely detailed and animated well. The same can also be said of your towers. Overall, the looks and sounds work, but do leave a bit to desired. When you first get into Savage Moon, you might feel you're onto something quite special. However, as the game progresses, the game quickly unravels. If you're looking for a tower defense game for you PS3, pick up PixelJunk Monsters. If you've played the game, and are looking for another challenge, Savage Moon should fit the bill. It's a satisfying game overall, albeit quite frustrating at times.